The distribution of earthquakes across the globe is shown in Figure 11.7. It is relatively easy to see the relationships between earthquakes and the plate boundaries. Along divergent boundaries like the mid-Atlantic ridge and the East Pacific Rise, earthquakes are common, but restricted to a narrow zone close to the ridge, and consistently at less than 30 km depth. Shallow earthquakes are also common along transform faults, such as the San Andreas Fault. Along subduction zones, as we saw in Chapter 10, earthquakes are very abundant, and they are increasingly deep on the landward side of the subduction zone. Earthquakes are also relatively common at a few intraplate locations. Some are related to the buildup of stress due to continental rifting or the transfer of stress from other regions, and some are not well understood. Examples of intraplate earthquake regions include the Great Rift Valley area of Africa, the Tibet region of China, and the Lake Baikal area of Russia. Figure 11.8 provides a closer look at magnitude (M) 4 and larger earthquakes in an area of divergent boundaries in the mid-Atlantic region near the equator. Here, as we saw in Chapter 10, the segments of the mid-Atlantic ridge are offset by some long transform faults. Most of the earthquakes are located along the transform faults, rather than along the spreading segments, although there are clusters of earthquakes at some of the ridge-transform boundaries. Some earthquakes do occur on spreading ridges, but they tend to be small and infrequent because of the relatively high rock temperatures in the areas where spreading is taking place. The distribution and depths of earthquakes in the Caribbean and Central America area are shown in Figure 11.9. In this region, the Cocos Plate is subducting beneath the North America and Caribbean Plates (ocean-continent convergence), and the South and North America Plates are subducting beneath the Caribbean Plate (ocean-ocean convergence). In both cases, the earthquakes get deeper with distance from the trench. 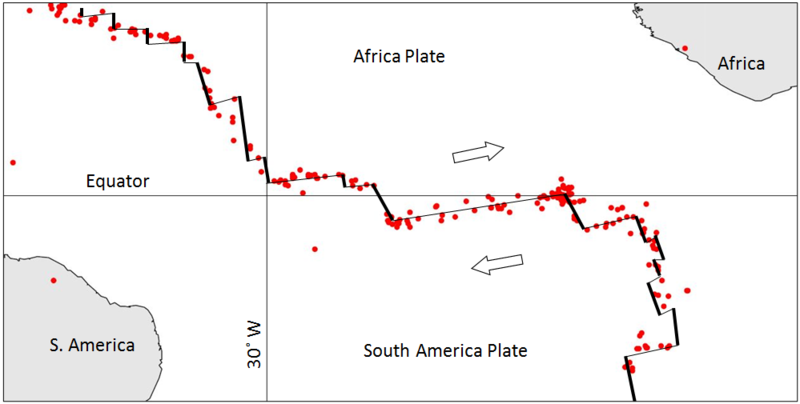 In Figure 11.9, the South America Plate is shown as being subducted beneath the Caribbean Plate in the area north of Colombia, but since there is almost no earthquake activity along this zone, it is questionable whether subduction is actually taking place. There are also various divergent and transform boundaries in the area shown in Figure 11.9, and as we’ve seen in the mid-Atlantic area, most of these earthquakes occur along the transform faults. The distribution of earthquakes with depth in the Kuril Islands of Russia in the northwest Pacific is shown in Figure 11.10. This is an ocean-ocean convergent boundary. 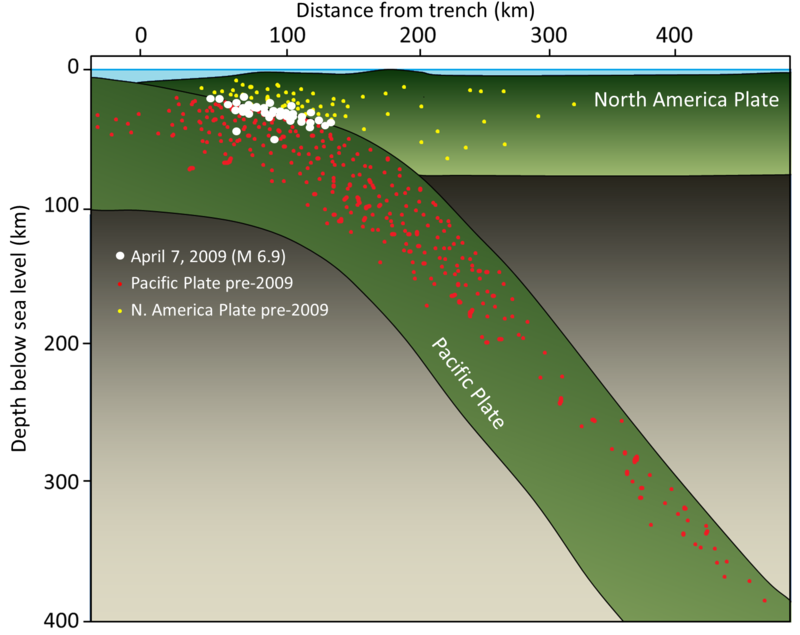 The small red and yellow dots show background seismicity over a number of years, while the larger white dots are individual shocks associated with a M6.9 earthquake in April 2009. The relatively large earthquake took place on the upper part of the plate boundary between 60 km and 140 km inland from the trench. As we saw for the Cascadia subduction zone, this is where large subduction earthquakes are expected to occur. In fact, all of the very large earthquakes — M9 or higher — take place at subduction boundaries because there is the potential for a greater width of rupture zone on a gently dipping boundary than on a steep transform boundary. 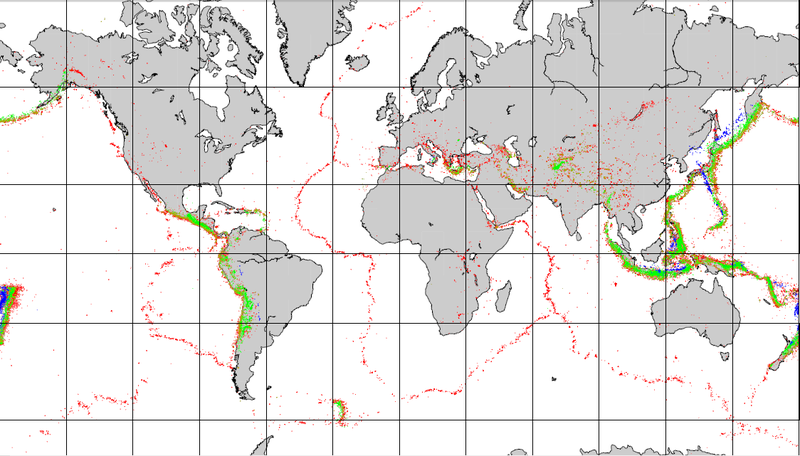 The largest earthquakes on transform boundaries are in the order of M8. The background seismicity at this convergent boundary, and on other similar ones, is predominantly near the upper side of the subducting plate. The frequency of earthquakes is greatest near the surface and especially around the area where large subduction quakes happen, but it extends to at least 400 km depth. 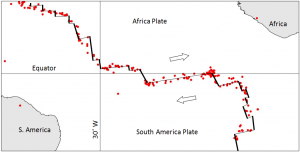 There is also significant seismic activity in the overriding North America Plate, again most commonly near the region of large quakes, but also extending for a few hundred kilometres away from the plate boundary. 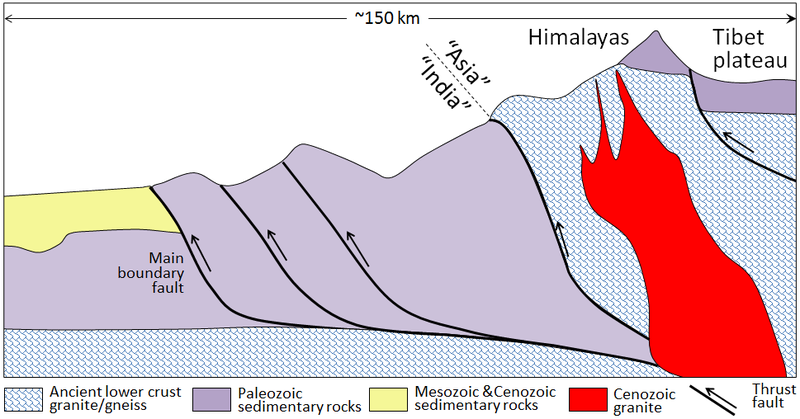 The distribution of earthquakes in the area of the India-Eurasia plate boundary is shown in Figure 11.11. This is a continent-continent convergent boundary, and it is generally assumed that although the India Plate continues to move north toward the Asia Plate, there is no actual subduction taking place. There are transform faults on either side of the India Plate in this area. The entire northern India and southern Asia region is very seismically active. Earthquakes are common in northern India, Nepal, Bhutan, Bangladesh and adjacent parts of China, and throughout Pakistan and Afghanistan. Many of the earthquakes are related to the transform faults on either side of the India Plate, and most of the others are related to the significant tectonic squeezing caused by the continued convergence of the India and Asia Plates. That squeezing has caused the Asia Plate to be thrust over top of the India Plate, building the Himalayas and the Tibet Plateau to enormous heights. Most of the earthquakes of Figure 11.11 are related to the thrust faults shown in Figure 11.12 (and to hundreds of other similar ones that cannot be shown at this scale). The southernmost thrust fault in Figure 11.12 is equivalent to the Main Boundary Fault in Figure 11.11. There is a very significant concentration of both shallow and deep (greater than 70 km) earthquakes in the northwestern part of Figure 11.11. This is northern Afghanistan, and at depths of more than 70 km, many of these earthquakes are within the mantle as opposed to the crust. 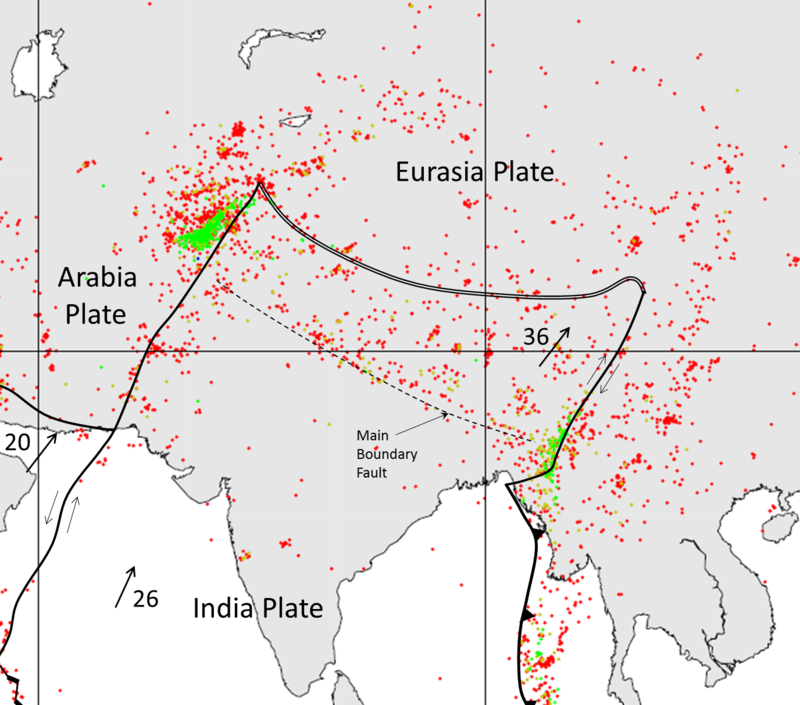 It is interpreted that these deep earthquakes are caused by northwestward subduction of part of the India Plate beneath the Asia Plate in this area. This map shows the incidence and magnitude of earthquakes in British Columbia over a one-month period in March and April 2015. 1. 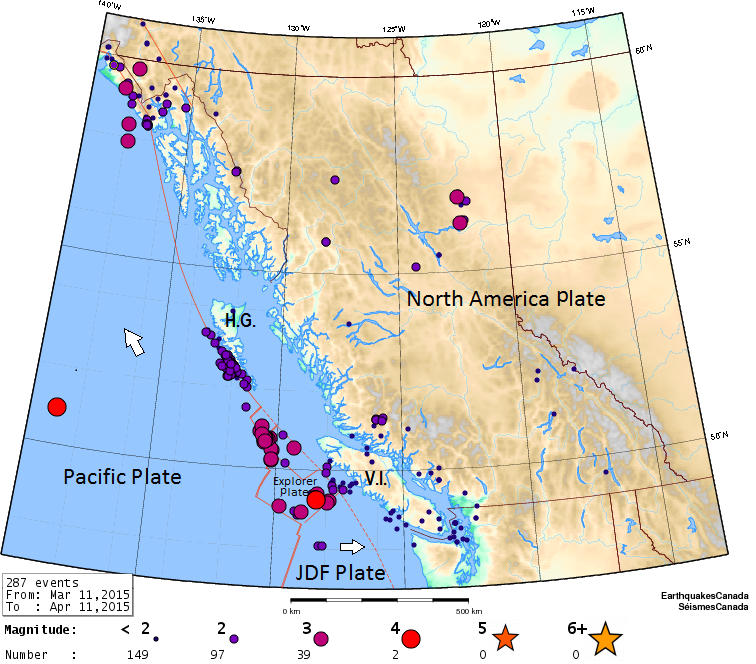 What is the likely origin of the earthquakes between the Juan de Fuca (JDF) and Explorer Plates? 2. The string of small earthquakes adjacent to Haida Gwaii (H.G.) coincides closely with the rupture surface of the 2012 M7.7 earthquake in that area. How might these earthquakes be related to that one? 3. Most of the earthquakes around Vancouver Island (V.I.) are relatively shallow. What is their likely origin? 4. Some of the earthquakes in B.C. are interpreted as being caused by natural gas extraction (including fracking). Which of the earthquakes here could fall into this category? Previous: 11.1 What Is an Earthquake? 11.2 Earthquakes and Plate Tectonics by Steven Earle is licensed under a Creative Commons Attribution 4.0 International License, except where otherwise noted.